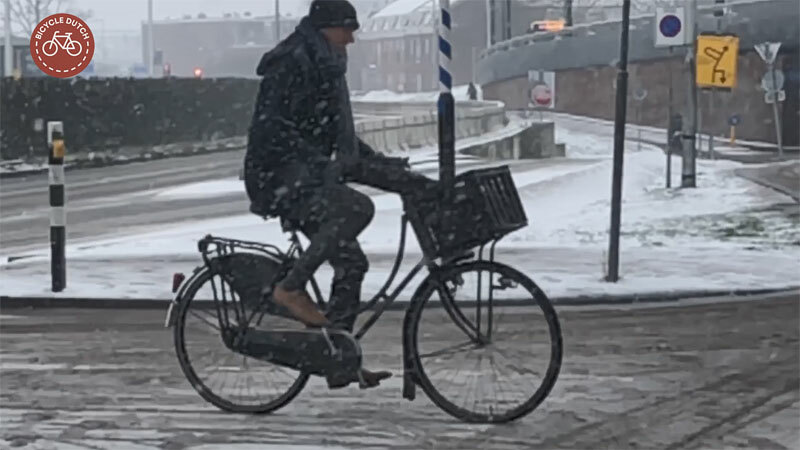 While quite some of my followers are suffering from the heat in Australia, most of you are in the northern hemisphere, like we are in the Netherlands, where it is winter. 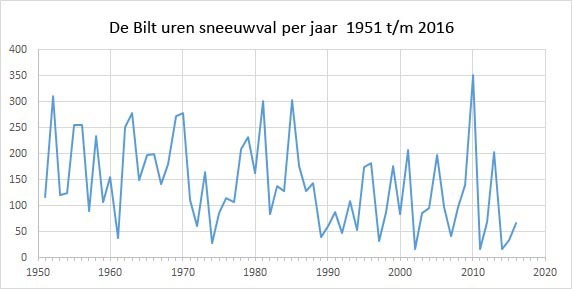 Dutch winters were never very severe, but since global warming really became noticeable in the last twenty years, the number of snow days has decreased even more. This phenomenon hasn’t stopped yet. There was a clear turning point in the 1980s when the snow depth really decreased. Snow is now so rare that it exites a lot of us very much. Cycling in the snow on the bridge from Vredenburg to Smakkelaarsveld in Utrecht. The busiest cycleway in the country is also busy during a snow storm on a January Tuesday afternoon! Children cycling three abreast on the very wide new cycleway on Jaarbeursplein. Recently, this cycleway came in the place of a four-lane road for motor traffic, that had been built in the very early 1970s. Once all of the reconstruction is finished at this location (probably later this year) there will be a blog post about this place. Not only global warming is the cause for less snow. The dominant wind direction in winter has also changed. The wind used to come from a predominantly north-eastern direction, which gives us cold directly from the arctic and Russia. Now, the wind more often comes from the south-west, which means the relatively warmer North sea brings the temperatures over freezing point and we get rain instead of snow. It is telling that our weather service counts the snowfall in hours per year, not even in days! I tell you this to try to make you understand why I get so exited when there is snow for a change! I was especially happy to experience the snow while I was in Utrecht. That had been a really long time ago. My last post showing snow in Utrecht is from 2010! No snow boots for this lady. She cycles – as she must always do – in her heels! 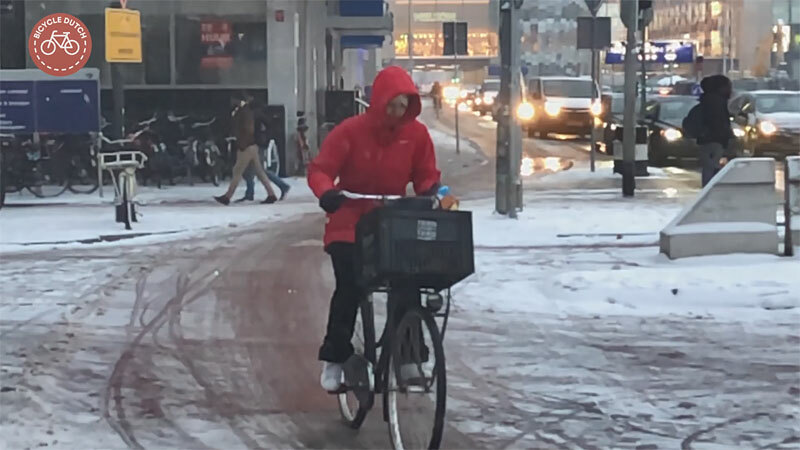 Peak Dutch: a man cycling on a granny bike with a box in front, in his business attire, in a snow storm. Tuesday 22 January 2019 was the day the snow would fall. The weather services had predicted it for days and sure enough, from 11 in the morning, the snow started to fall in Utrecht. 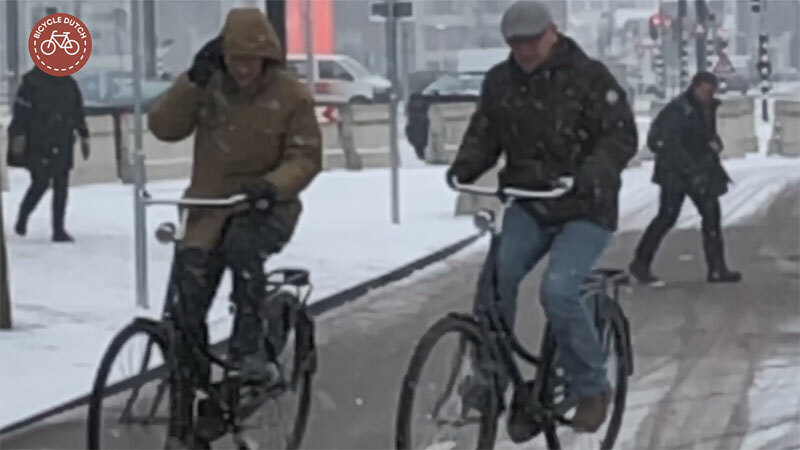 During my lunch break I went into the city centre, while it was still snowing, to see how the Dutch adjust their cycling habits. Or rather – how they do not. If you had gone to school by bike that morning you needed to go back like that as well, of course. There didn’t seem to be a lot less cycling than on a usual Tuesday afternoon. Children cycled home from school, men and women ran errands and went from one place to another on their bicycles to do so. There were even people who didn’t wear gloves or a hat. The snow was still falling and all these snow flakes made my camera act up. The images are less sharp than usual, but I hope you still find them nice enough to look at. As an experiment, I filmed in slow motion for a change, so you can really see what it is like to cycle in the snow. Enjoy! 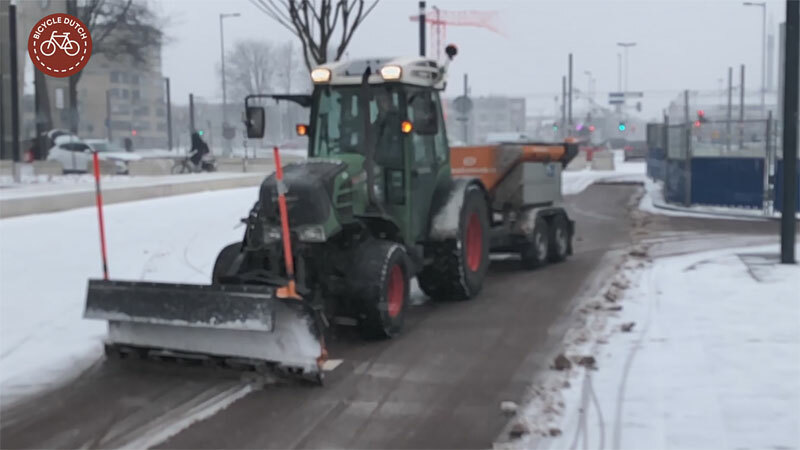 This snow plow on Jaarbeursplein shoves the snow aside and then disperses a mixture of salt and water on the cycleway. The driver had just come from the same direction. He had turned in the distance. That is why the right half of the path is already clear. His turning around gave me enough pre-warning and time to film the vehicle nicely. It is clear that these men were just dressed for winter, not so much for a snow storm. The man on the left will not normally wear that hood, I am sure. Hoods always tend to get blown to the back while you cycle. That is why he needs to pull it forward again. This woman has a better hood. The smaller opening catches less wind, so it will stay in place. Judging from her facial expression she is not so exited about cycling in this snow! A nice demonstration that the prejudice that the Dutch all own the same bike is not true. From left to right: a granny bicycle, a standard gentlemen’s bicycle and a mountain bike. The man on the granny bike has what appears to be a cake box dangling from his handlebars. And why wouldn’t you transport a cake like that though a snow storm? 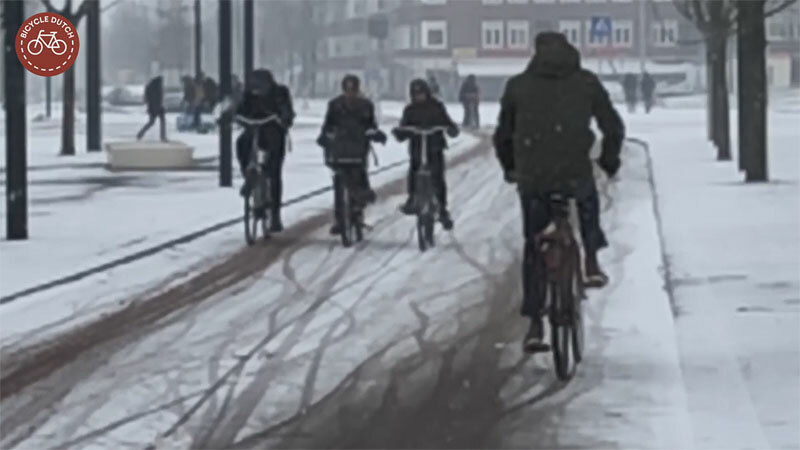 This week’s video: cycling in the snow of Utrecht. 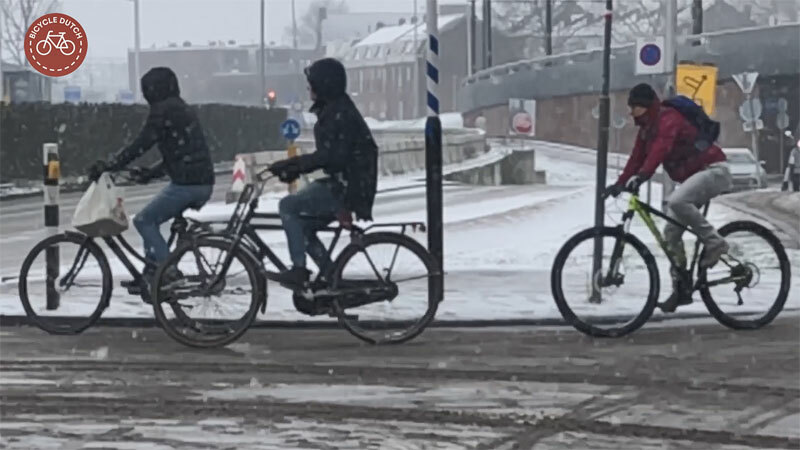 For Wednesday 30 January (the publication date of this post) there are new weather warnings, predicting up to 5 centimeters of snow in Utrecht in the afternoon. Great video! I live in Hamilton, Ontario, near Toronto. The temperature is currently -22. We have had over 30 cm of snow in the last week, but the City has carefully cleared and gritted all of the major bike paths so we can get around. “Hoods always tend to get blown to the back while you cycle.” Perhaps this is a Canadian thing, but hoods here tend to come with a drawstring. They can be tied tightly to the head so they do not blow back. Nice article. It takes fortitude to get out on your bike in the early morning in winter with snow on the ground. Makes you strong in mind and body. Calling it a snowstorm seems a bit extreme, for some nasty cold wind and fairly gently falling snow… a snowstorm sounds like it should be a blizzard, with very bad visibility and near-whiteouts. Though it was more fun to watch it falling from inside than to be out in, as the wind was a penetrating watery cold one. 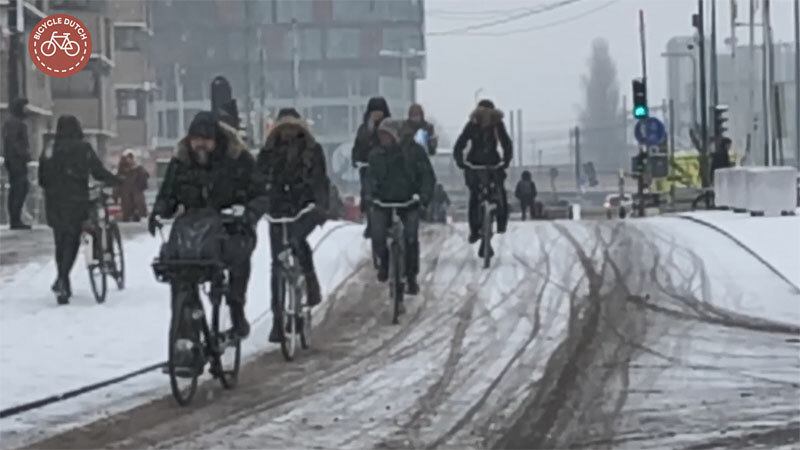 It was very challenging bicycling on the smaller secondary streets in Utrecht where there was no snow removal. My husband and I finally got smart and figured out a route that took us on main roads to get to our destination. That’s the nice thing about Utrecht, There are so many ways to choose to get to your destination. Beautiful photos expressing the joy of Nederlands and fiets. I am American and I’m in Florida where the weather is being cooperative, but it is still s little bit chilly here. I was in Den Haag last year for several days where we have good friends. And also in Amsterdam and Apeldoorn, We had snowfall in Amsterdam. This was the last week of February. Many cyclists still on their bikes in the snow, but it was slippery! I used to cycle in cold wet conditions until I hit a patch of “black ice” and broke my shoulder in three places! It was so painful ands took months for the bone to heal. The soft tissue has not healed totally and I have been told may never will. This was over 2 years ago! So my suggestion to anyone who may want to cycle in the snow or cold wet asphalt: DO NOT! My suggestion: DO NOT FALL! The rest of us manage, you just have to be careful. 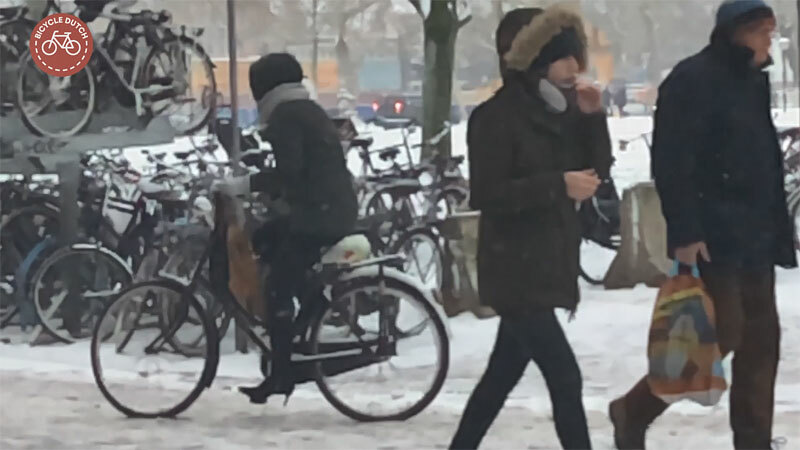 This entry was posted on 30 January 2019 by Bicycle Dutch in Original posts and tagged snow, Utrecht, watching people cycling, Winter.